Over the last ten years, drivers struck and killed nearly 50,000 people walking the streets throughout the United States. That’s more than 13 people per day! Unfortunately, a lot of these incidents happen right here in the Sunshine State. Florida has recently been named the most dangerous state for pedestrians based upon the Smart Growth America and the National Complete Streets Coalition. In fact, nine of the 20 deadliest US cities for pedestrians are in Florida, with Orlando ranked as least safe and the Miami-Fort Lauderdale-West Palm Beach area coming in at number 14. Why is Florida so often guilty of pedestrian-related accidents? Billy Hattaway, the transportation director for the city of Orlando, has answers. He believes that the design of many Florida roadways and community developments, high-speed limits, and lack of safety precautions taken by drivers and pedestrians all are to blame. "Everyone has a responsibility to share the roadways safely," Hattaway says. To that end, he has helped shape Vision Zero, a program designed to “eliminate all traffic fatalities and severe injuries, while increasing safe, healthy, equitable mobility for all." The Vision Zero website is chock-full of information, including free webinars and case studies, so we highly recommend checking it out. In the meantime, it’s important to recognize the causes of many accidents. 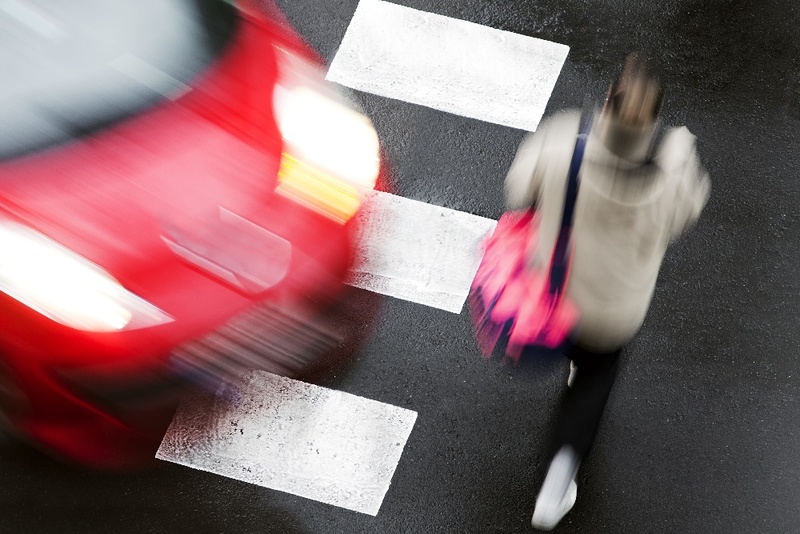 While accidents may happen to anyone, there are steps you can take to ensure your health, safety, and rights are protected if you are a pedestrian hit by a vehicle. If you are a pedestrian hit by a car on the street or in a crosswalk and are conscious and able to move, get to safety and away from traffic. Assuming you have your phone, call local police or 911 and wait for them to arrive. Do your best to be sure the driver also stays at the scene until police arrive, but use your phone to snap photos of their vehicle and license plate to play it safe. Unless you're in a rural area or it's late at night, there will likely be other bystanders stopping to help, which may help to ensure the driver doesn’t leave the scene. If the driver remains on the scene and you're able, ask for their driver’s license, insurance, contact information, and license plate number. If there were any witnesses, it is essential to get their information and statements as well. While you should have taken photos of the vehicle and license plate, it can be beneficial to take photos of the area where the accident occurred, traffic lights, the intersection, and street signs. You may wonder, how is it possible to sustain injuries like these and be unaware of them? The fact is, getting hit by a car can leave you in shock, unable to feel the pain of a broken bone or internal injury right away. So, always let paramedics check for potential injuries and take you to the ER if needed. It's also important to document all accident-related expenses, including medical bills and proof of lost wages, in case you decide to take the matter to court. Insurance companies often try to pay as little as possible or even deny valid claims, so after an accident it is vital to contact an experienced personal injury attorney. In some cases, the municipality where the accident occurred may even be held liable for a pedestrian's injuries due to the failure of traffic control devices or poorly designed roadways and intersections. Florida is a no-fault state. This means that if you have car insurance, you may be covered by your own personal injury protection policy (PIP) even though you were injured as a pedestrian. When you talk to a driver’s insurance company, be honest but don’t admit fault. Avoid statements like “It was my mistake” or “I’m sorry.” Do not give a recorded statement or sign anything without first speaking to a pedestrian accident attorney. Whether it’s due to the number of elderly citizens residing in Florida, tipsy tourists driving under the influence, or just poor infrastructure, Florida has got a bad reputation when it comes to pedestrian accidents (CityLab.com further verifies this). To stay safe, check out these useful pedestrian safety tips from the Florida Department of Transportation (FDOT). And, if you have been injured or have lost a loved one who was a pedestrian hit by a car, our skilled bicycle and pedestrian accident lawyers will are ready to fight to get you the compensation you deserve.